Don’t you just love it when the sun, the moon, and the stars all align? 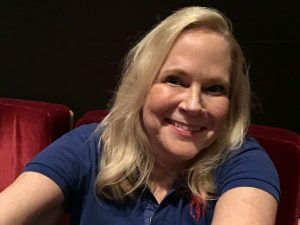 Typically, I receive special film screening notices fairly regularly that take place in major cities like New York, LA, San Francisco, London, or Chicago. 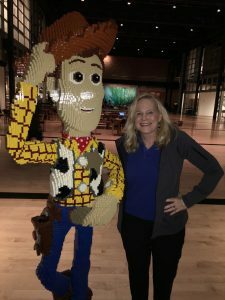 Imagine my delight when I discovered that a special screening of Finding Dory was not only being held on a day on which I’d be in San Francisco visiting family but also at the exclusive Steve Jobs Theater at Pixar Animation Studios. A rare occurrence indeed! 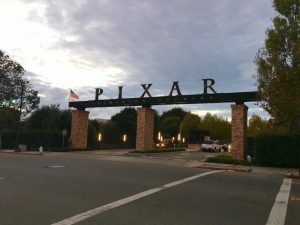 First of all, Pixar Studios in not open to the public, so the chances of ever seeing the inside for most of us are slim to none. You have to be invited or know someone to get inside. Needless to say, I jumped on the opportunity. 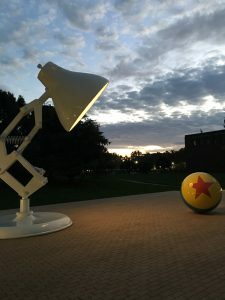 Upon passing through security at the front gate, I walked toward the left of the expansive campus and was greeted by the ginormous iconic desk lamp, Luxo Jr., and its pal, the yellow ball with the blue stripe and red star. 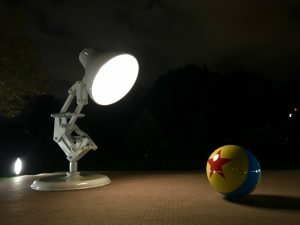 It’s been thirty years since the groundbreaking short film Luxo Jr. put Pixar on the map. Upon walking into the Steve Jobs Building, you will find a very large atrium area that can house the entire staff. 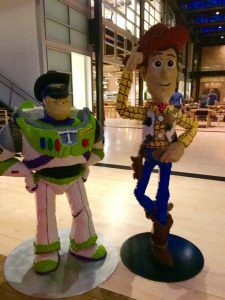 Two life-sized characters greet you and are constructed entirely out of Legos: Woody and Buzz Lightyear from the Toy Story films. 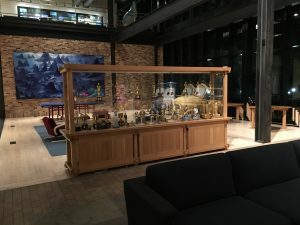 Near the front desk, you’ll also see the pink elephant Bing Bong from Inside Out. 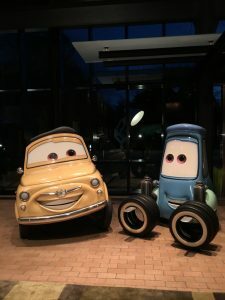 In front of the windows, you’ll see two giant cars; Luigi (yellow) is parked next to Guido (blue), both from Cars. 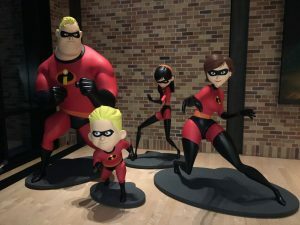 To the far left front corner are several statues of the Incredibles family. 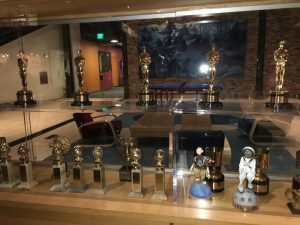 To the far right front, you’ll see an awards cabinet that contains Oscars and Golden Globes, along with other accolades and mementos. 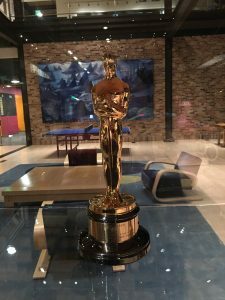 Eight of Pixar-Disney’s films have won Academy Awards for Best Animated Feature Film: Finding Nemo, The Incredibles, Ratatouille, WALL-E, Up, Toy Story 3, Brave, and Inside Out. 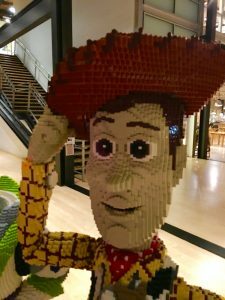 On June 18, 2010, we had a young child about six years old by the name of Caleb come into the City Hall at the Magic Kingdom park. 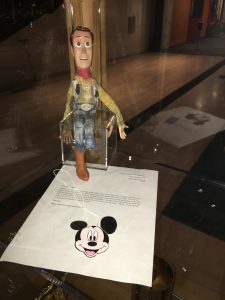 He brought us his well-played with Woody doll. 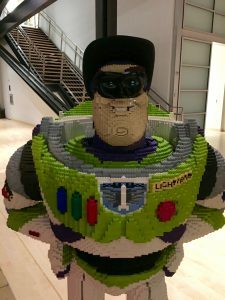 You see, his parents bought him a new one, and he wanted his first one to have a great new home, so he left it here to spend infinity and beyond with Buzz Lightyear. We felt it was appropriate to share him with you. As you can see, he has been loved very much over the years. Thank you for giving everyone great characters that have heart. 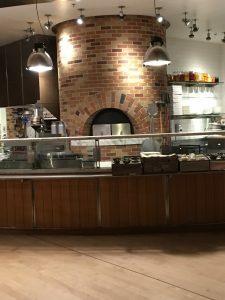 The entire lower left side consists of a state-of-the-art kitchen that’s equipped with a brick pizza oven. 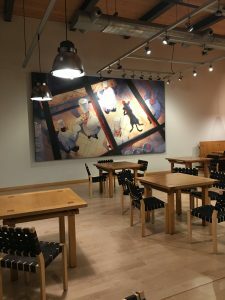 There’s a large seating area and an oversized painting from the film Ratatouille. 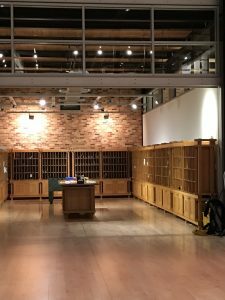 The lower right side has a mailroom, breakfast room with multiple cereal bins, Pixar gift shop, and an area for special displays. 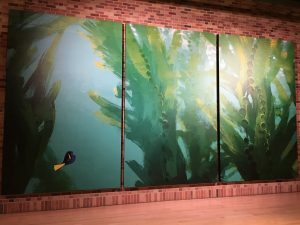 Straight ahead is a large mural backdrop painting of an ocean scene with a very small blue tang fish Dory from the film Finding Dory near the entrance of the Steve Jobs Theater. Upon entering the theater, you’ll find a stack of spiral tablets, pencils, and pens for note taking. The seats are made of a luxurious red velvet fabric and very comfortable. When the lights were dimmed, and the film was about to start, tiny twinkling lights that looked like stars covered the ceiling, creating a magical effect. Upon the start of the film, those lights disappeared. 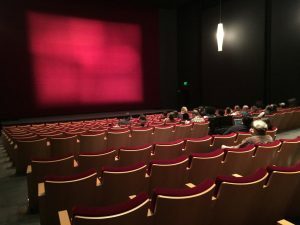 The most noticeable high-tech feature of the theater has to be the sound. It’s like no other I’ve experienced anywhere in the world, even in my forty-five-seat Chicago Lake Street Screening Room press theater. The Steve Jobs Theater’s sound is a standout. I have to add that the colors were very vibrant on the screen as well. All in all, being invited to view a film here was a memorable experience, especially for a person whose job depends on spending countless hours inside a theater. 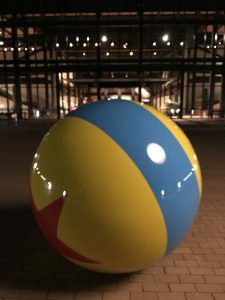 If you ever get the chance, I can recommend that you visit Pixar Studios, even if it’s just to see a film, because seeing a film at Pixar is a giant step above any theater in the world.